Raw Fury have made a very positive start to what will hopefully be a very successful and long-term relationship with Nintendo and its trailblazing hybrid console. First they brought hard as nails roguelike, GoNNER to Switch. The cult-favourite 2D platformer has kept many gamers – myself included – endlessly entertained, mostly thanks to the steep difficulty curve, daily challenges and moreish combat. Next to turn up on the eShop was the aesthetically glorious 16-bit strategy title, Kingdom: New Lands, another keeper that many a Switch owner has poured many enjoyable hours into. In fact, a friend of mine has logged over 70 (yep, that’s seven-zero) hours into it. Raw Fury are even working on a follow-up called Kingdom: Two Crowns, which amongst more, adds co-op gameplay into the mix. Exciting times indeed. So, GoNNER was excellent, Raw Fury’s difficult ‘second album’ on Switch was arguably just as good, and now we have their third Switch title to take a look at, the all-kinds-of-bonkers, Uurnog Uurnlimited. First of all, while the game is published by Raw Fury, it is actually created by Swedish developer, Nicklas Nygren, AKA ‘Nifflas’. If that name is ringing a bell for Nintendo stalwarts, it’s with very good reason. Nifflas is the guy who made the freeware Knytt series on PC and later brought the rather excellent Metroidvania delight, Knytt Underground to the Wii U way back in 2012. Where has the time gone, right? Anyway, GoNNER and Kingdom: New Lands – and to a lesser extent, Knytt Underground – were always going to be extremely tough acts to follow for Raw Fury and Nifflas, but regrettably, Uurnog Uurnlimited fails to approach the dizzying heights of those addictively challenging forebears. However, you can’t argue that Uurnog Uurnlimited doesn’t look the part. It looked impressive in the pre-launch trailer and screenshots, but seeing it first hand, particularly in handheld mode on the Switch’s glorious 6.2 inch display, its unique art style looks terrific. I don’t know if it was what he was going for, but Nifflas’ latest creation reminds me of a mash-up of Knytt Underground and Geometry Wars, which is no bad thing by any stretch of the imagination. It sounds good too, with a catchy score and authentic sound effects. For any game however, its bread and butter is always going be how it plays, and more importantly, how it makes you feel. While Uurnog Uurnlimited isn’t a bad game by any means, not even close, I do have to admit that it often left me feeling flat. Some of it even a tad like busywork. Where many games can disappoint at launch and therefore not review particularly well for say, performance reasons or technical bugs, they can always be updates and sometimes vastly improved. But you cannot magically patch in improved gameplay. Speaking of which, let’s look at how it plays. Uurnog Uurnlimited’s beautifully chaotic world is made up interconnected rooms, which are accessed via portal-like numbered doors that whisk you off from one place to another. These doors are opened by keys, which are in turn gained by solving puzzles. The object of the game is to collect weird and wonderful animals and store them in a huge box situated in the base, hub room. Sounds simple enough. Clearly, the puzzles are where it’s at though and it can’t be argued that they aren’t clever or indeed, very smartly put together. Although they can feel almost messy at times, what is good – and quite unusual these days – is that they can be solved in multiple ways. This fact means there’s much appreciated diversity and that you’re not constantly trying to muddle your way through the game, looking for just a single solution. I know that statement is kind of obvious, but it’s also pretty cool and well worth making a point of. Puzzles are solved using blocks, which are scattered around all over the place. These blocks can be picked up and even stored in your inventory. They are also used for a number of different properties. Sure, some are used simply as a step to get to an otherwise unreachably high platform, but others are bombs (which can be remotely detonated), birds (for fluttering over longer jumps, Yoshi-style), guns (for uurrm, shooting stuff) and even HP healers. 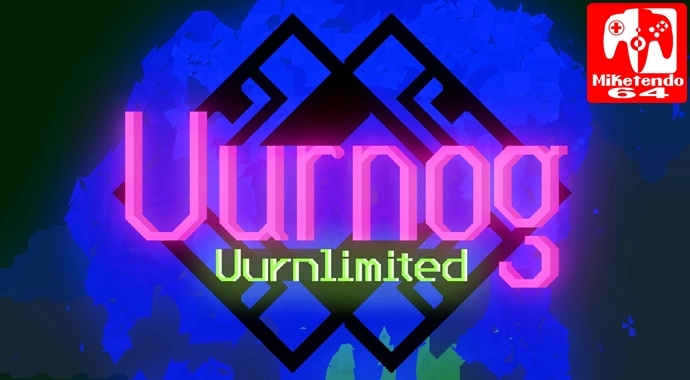 Like I said, Uurnog Uurnlimited certainly doesn’t lack diversity, or deliciously quirky originality. For me, it’s just let down by the slightly convoluted way of working out how to solve puzzles, moving animals to pen in your save room and what I mentioned earlier, the fact that it can – though not always – feel like a bit of a slog, a tad frustrating, a little like hard work. Don’t get me wrong though, there will be many who are seduced by the Raw Fury label and maybe even Nifflas’ previous work. Indeed, many may find the game entertaining and find it worth the price of entry. Subjectively however, Uurnog Uurnlimited falls flat. Like a glass of cola that’s been left overnight. The ingredients are there, the taste is right, it’s just lacking the bubbles. Given its gorgeous art direction and the potential of the clever gameplay mechanics, it is incredibly frustrating that Uurnog Uurnlimited falls to reach the highs that its potential hinted at. Raw Fury have an excellent early track record on Switch, but I can’t make a recommendation on the strength of that alone. Unfortunately, I would have to advise giving Uurnog the slip, at least until it is on sale at a potentially too-good-to-miss price. At its current price point however, I tend to expect better.